One of the most popular features within v10.1 will undoubtedly be the new status reports, sent to administrators daily or weekly and providing an invaluable overview of important events at a glance. 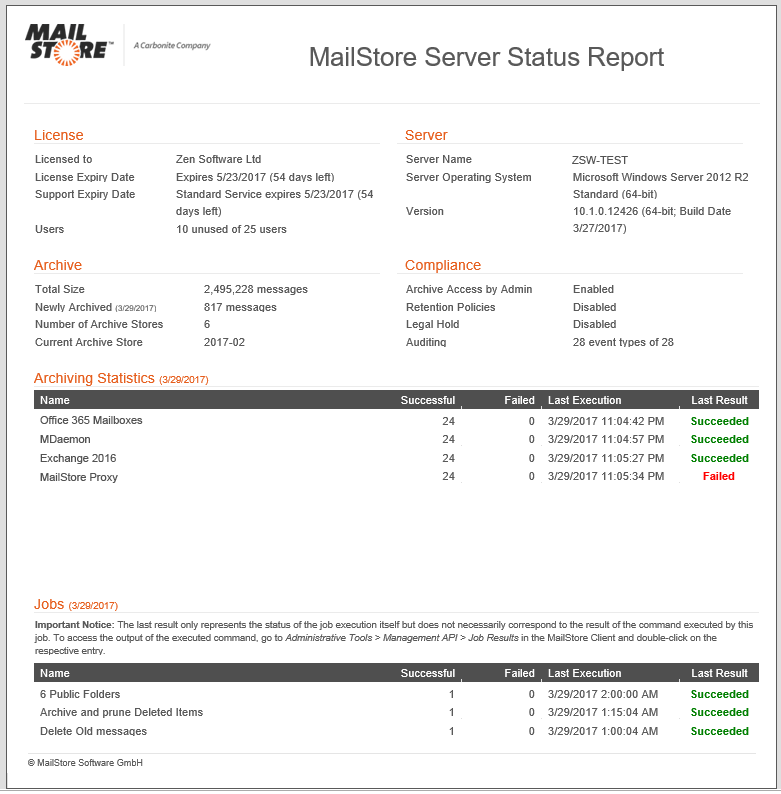 The reports contain plenty of useful information, including the status of jobs, licensing details and compliance settings for each of your archives – all of which should make the ongoing management and maintenance of MailStore easier than ever. Another new feature in v10.1 is the additional search field options which now enables users to search specifically in the attachments, or only in the emails. In addition, Version 10.1 also doesn’t have any limits for indexing attachments, plus the “advanced search” can be started immediately with a right click on an archive folder. Optimized detection and handling of “Sent Items” folders – MailStore Server recognizes appropriate folders via IMAP and allows the administrator to define several of them as “sent objects”. Improved monitoring of admin access – To avoid unintentionally triggering certain actions, the administrator’s password is now requested again when accessing user mailboxes. 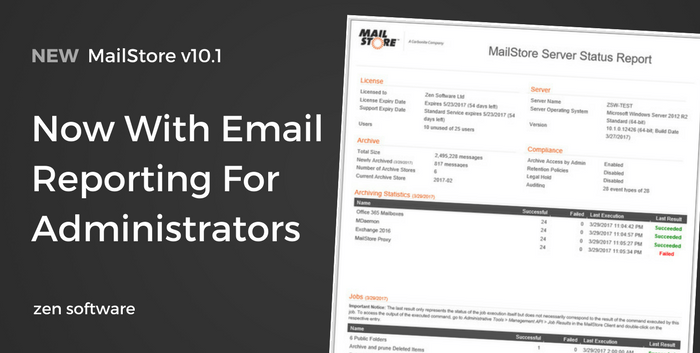 MailStore Server is the ideal tool for bringing your email server and mailboxes back under control. Automatically manage your mailbox sizes, upload and centralise scattered PST files and satisfy compliance requirements, all without limiting the amount of email that’s available to users. Bring your installation up to date in minutes by simply downloading the latest version from the link below and over-installing – provided you have current upgrade protection. Not sure if you’re eligible for the free upgrade? Check your licence key using the upgrades checker on our site.